Thank you so much for the beautiful cabinets. We are absolutely thrilled with the work that you did and the attention to detail. It is so rare to find people who are so committed to what they do and the product that they make. ...the cabinetry you built for our house is exceptional. Visitors are amazed with the design and the quality of craftsmanship. Thanks for the great job on the cabinets. We are extremely happy with the final outcome. Thanks for creating my dream kitchen. You are truly a craftsman. The quality and the workmanship is superior. I would highly recommend you to anyone & I have. Thank you very much for a great job. I will be back!! Thanks, for a superior job, done! Custom cabinets for your home or office. 3 for 3 Trillium Award winner. 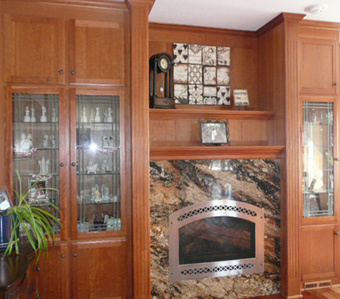 Picha's Cabinet Shop is a full service cabinet maker from start to finish. New or remodel. Planning, design, layout, computer drawings, build and install. We build and install cabinets for your Kitchen, Bathroom, Laundry, Office, Bar, Entertainment, Fireplace & Garage and we take pride in our work to ensure our customers satisfaction. Wood choices include: Oak, Quarter Sawn Oak, Cherry, Rustic Cherry, Alder, Rustic Alder, Maple, Pine, Birch and Hickory. Door styles include: Flat Panel, Raised Panel, Arch Raised Panel and Panels with Applied Moulding. Drawer interiors include: White Melamine, Maple and dovetail Maple. Drawer slides include: Standard, Full Extension, Full Extension Soft Close and Blummotion Slides. Hinges Include: Euro Hinges with Soft Close. Hardware includes: Amerock, Hickory and Belwith Keeler. Countertops include: Laminate, Granite, Cambria, Corian, Himacs, Silestone, Hanstone, Cultured Marble, Etc. Picha's Cabinet Shop is a custom cabinet maker located in Shakopee, MN and servicing a 20 mile radius from our shop including the cities of Belle Plaine, Bloomington, Burnsville, Chanhassen, Chaska, Eden Prairie, Edina, Jordan, Lakeville, New Prague, Prior Lake, Richfield, Savage, Shakopee and all surrounding areas. 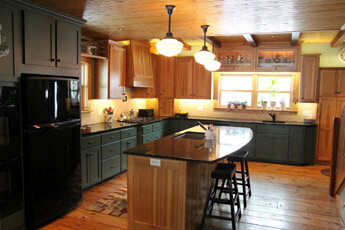 Call us today about all your custom cabinet creation and installation needs!